In my photography class I had the privilege of using a "view camera," it has some nifty functions that today's fancy point and shoots can't even imagine. Wikipedia, as usual, has an excellent article describing them, with a section talking about the tilt or swing technique I used in the photo below of my classmates in NJIT's Eberhard Hall. Notice what is in focus, and what is not in focus. With the View Camera in the setting below, everything in the plane of the wall (near and far) will be in focus but everything else will be blurry (near and far). The largest aperture setting was used to get maximum blurriness. This sort of picture is impossible to take with a normal camera. Above is the View Camera that was used, with an exaggerated angle between the lens plane and the film plane. See dynamics in the image below, it was taken from this website explaining them. 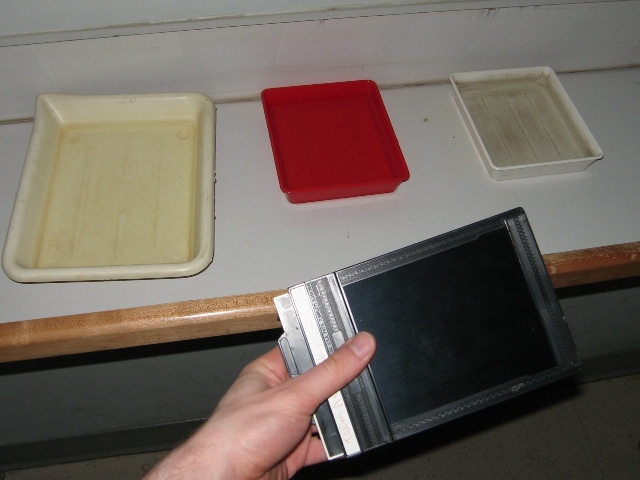 I developed the film as well, one negative at a time, in a dark room with the film case below.